Reflection of light is the change in direction of light rays that strike the boundary between different mediums. Point of incidence: the point on the reflecting surface where the light ray strikes. Incident ray: light ray striking the reflecting surface. Normal: an imaginary line perpendicular to the reflecting surface at the point of incidence. Angle of reflection, r: the angle between reflected ray and the normal. First Law: The incident ray, the reflected ray and the normal to the surface all lie in the same plane. Second Law: The angle of incidence is equal to the angle of reflection. i.e i = r.
All surfaces reflect light but the smoothness of a surface affects the reflection of light. Regular reflection that occurs at smooth surfaces like mirrors. -Parallel light rays incident on the surface produce parallel reflected light rays. -All light rays have the same incident and reflected angle. Irregular reflection (or Diffused reflection) that occurs at rough surfaces like cloth. -Parallel light rays incident on the surface are reflected in all direction. -The Normals are not parallel. -The incident and reflected angles of each ray are different from those of other rays. Real image is an image that can be captured on a screen. Virtual image is always upright whereas real image is inverted. “Laterally inverted” can be seen as “a reflection of object about the rightmost end”. Tip: Image can be easily obtained by doing a reflection about the imaginary line. An interesting video on a typical O-Level MCQ question: What happen to the size of the image when the object is moved nearer to the mirror? Check it out now! 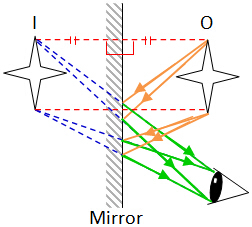 Step 1: Locate the ﻿image﻿ behind the mirror using the concept that ﻿same perpendicular distance﻿ from the surface of the mirror to the image and object. Step 2: Draw ﻿reflected rays﻿ from image to eye. Dotted lines for virtual rays whereas ﻿﻿﻿continuous lines for real rays﻿﻿﻿. Step 3: Draw incident rays using continuous lines. Note that we normally draw two light rays to locate position of mirror image. Likewise for extended objects, we can use same steps to locate the image. Four pins A, B, C and D are placed in front of a mirror. A student P is standing behind a cardboard. Which image(s) can be seen by the student?